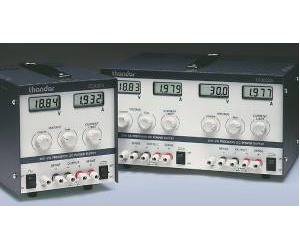 The Thurlby Thandar TS series of laboratory bench power supplies has become highly regarded throughout the world for its performance and reliability. High resolution controls enable precise setting of voltage and current levels whilst high accuracy digital meters provide clear, unambiguous readings. TS series units incorporate digital meters with 3.5 digit LCD displays to provide greater accuracy and resolution than other PSUs. Separate meters are used for voltage and current, eliminating the need for meter function switches. The TS series sets the standard for simple and comprehensive control. Voltages are set with coarse and fine controls for speed with precision. Currents are set with a semi-logarithmic control for increased resolution at low currents. With the output switch ‘off’ the current limit set point is displayed. With the output switch ‘on’ the actual output current flowing is displayed. This invaluable feature allows delicate circuits to be protected by accurately setting the current limit level (down to a few milliamps if necessary) before connecting the circuit under test. TS series units can operate in constant voltage or constant current mode (not TS3023 logic output). TS series units incorporate integrated band-gap reference diodes as the basis for stabilisation of both voltage and current. Remote sense terminals enable the precision to be maintained at high currents by eliminating the effects of connection lead resistance. TS series PSUs are designed and built to meet the latest safety and EMC requirements. All outputs are fully protected against short circuits, external overvoltage and reverse voltage.